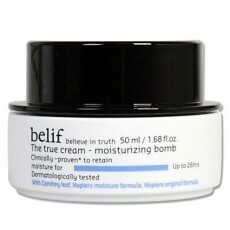 If your skin is super dry and dull, the True Moisture Bomb from Belif comes to the rescue. This cushiony cream is clinically tested to give your skin intense moisture and soothing care up to 26 hours! It iabsorbs quick to your skin without greasiness and leaves skin supple and smooth. this moisturizer has been the Bestselling Moisturizer in Korea for many years. Apply adequate amount of the moisturizer as the last step of your skincare routine in the morning and or in the evening. Apply on face and on the neck.